Cline Tool has a lot to be proud of. Apart from its 70-year history as a Newton-born custom tool manufacturer and distributor, the company takes pride in maintaining a cognizant approach to a constantly evolving industry, finding solutions to customer problems and having established itself as one of the largest custom tool manufacturers in the United States. Chief Financial Officer Jason Benson said what distinguishes Cline Tool apart from similar companies is its dual identity as a custom tool manufacturer and full-line industrial distributor. That mix, he said, does not ordinarily exist in the marketplace, which is what makes Cline Tool so special. line Tool’s Newton headquarters, sequestered in the north side of town just a few blocks away from Berg Middle School, reflects that business model. Salespersons and management representatives share a roof with machinists and engineers but are separated into two sectors: an office-style workspace and a vast factory equipped with intricate and lively machinery. President and Chief Executive Officer Jim Long, who began his tenure at Cline Tool in 1987, said the distribution division represents about 700 different companies and sell their products into the market. Simply put, Cline Tool provides and sells everything a factory setting needs to operate — from safety supplies to cutting tools and maintenance items. Cline Tool is a manufacturer that helps other manufacturers. For instance, if John Deere wants to make a transmission for one of its tractors, the corporation would most likely contact a manufacturer like Cline Tool to design and create a tool to machine the transmission in order to actually produce it. Benson said it’s not a concept most consumers think about when they see a tractor on a lot of a dealership. The people who do think about that kind of stuff, he added, are the kind of people Cline Tool wants on its workforce. Designing and manufacturing custom cutting tools is how the company got its start in Newton in 1948, a reputation Cline Tool has retained for seven decades. As the manufacturing industry grows and advances, Cline Tool adapts and stays ahead of the curve, evolving its methods and technology to better meet customer needs. Since its inception, Cline Tool has extended its reach across and opened three more facilities in Houston, Texas; Rockford, Ill.; and Asheville, N.C.
Long and his group purchased Cline Tool in 2010. During that time, the company was operating under 28 employees. Today, that number has increased to just under 100 workers across all four locations; about 65 of which remain in the Newton headquarters. What has been the key to Cline Tool’s longevity? Benson cites its workforce. Everyone, from the management to the employees, he said, truly believe in providing the ultimate customer experience and finding solutions for businesses it works with, including local names like Thombert, TPI Composites and Gates Corporation. In doing so, Cline Tool has expanded its custom tool manufacturing and distribution duties to include complete project management, tool reconditioning, integrated supply programs and comprehensives engineering services. Quality requirements are tight these days, Long said, as is staying ahead of the technology and providing diversified services to other businesses. 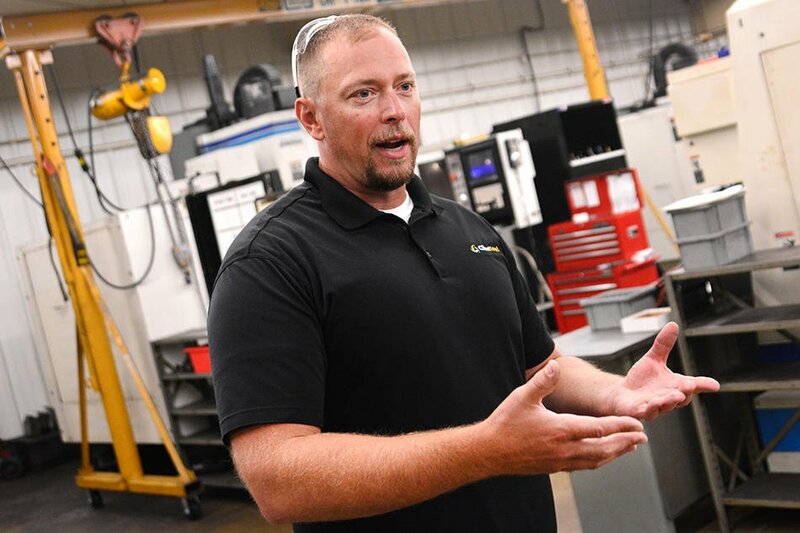 “It’s an ever-changing world and it takes continuous reinvestment in the business, especially when you start looking at 3D printing and the five-axis machining,” Long said. Despite the shifting landscape, Cline Tool has had to adapt to over the years, the one thing that has not changed is its stay in Newton. And it’s not going anywhere any time soon.